When I was in Italy in May one of my favorite experiences was taking a train from La Spezia to see the villages of the Cinque Terre. The first stop was the village of Riomaggiore. It had been raining when I boarded the train in La Spezia but as the train pulled into the station at Riomaggiore the storm had ended and the clouds were transitioning to blue sky. It was late morning and an ideal time for a walk, although it was challenging because the sidewalks were so steep. While walking I couldn’t decide whether to look at the buildings, some with laundry hanging from terraces, or do a little souvenir shopping. Another thought was to look for a gelato shop and keep walking. Since they were such interesting possibilities I decided to do all of them! 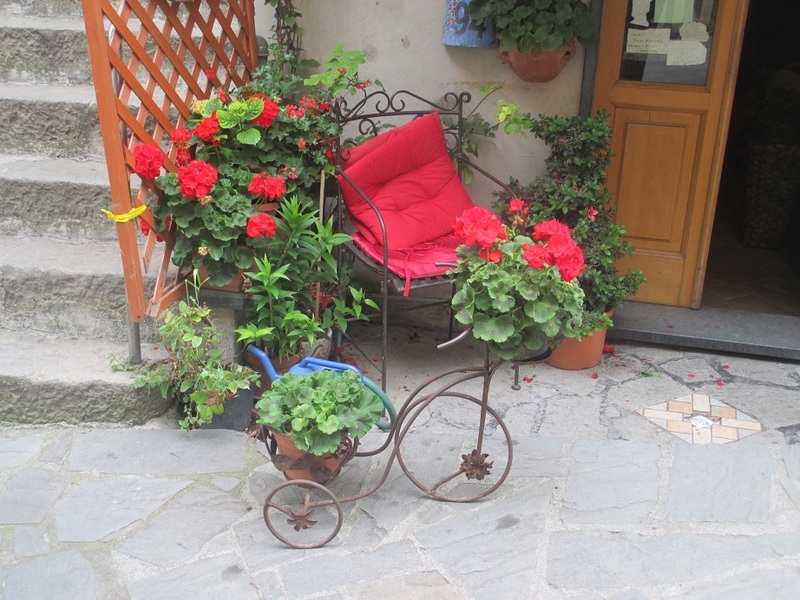 Although this chair looked inviting for a little rest, I had a train schedule to follow to get to the other villages so eventually I had to walk back to the station to catch a train to Manarola, another village in the Cinque Terre. I’ll tell you about that soon.